November 2007 brings the 160th anniversary of the death of Felix Mendelssohn, which means this year we are going to hear a lot of Fingal’s Caves, Italian Symphonies, and Violin Concertos. Which is a shame, as Mendelssohn wrote much other fine music which deserves to be heard more often. But the good news is that even if the concert and broadcast programmers stick to his greatest hits you can explore more of Mendelssohn’s fine music on two very affordable CD sets. 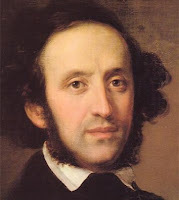 Mendelssohn grew up in Berlin, and was a student at the Singakadamie where he first studied the compositions of J.S. Bach, and it was in Berlin that he gave the celebrated anniversary performance of the St Matthew Passion in 1829. While director of the Leipzig Gewandhaus Mendelssohn regularly performed Bach’s music, and he edited several of the organ works and was a key figure in the publication of the first complete Bach edition. The influence of Bach can clearly be seen in Mendelssohn’s own organ and choral compositions, and I want to recommend two CD sets which give a wonderful opportunity to explore these influences. Mendelssohn performed Bach's organ music on his recital tours, and he was familiar with instruments from Bach’s time including the two Silbermann organs in Rötha near Leipzig. The shadow of Bach is most evident in Mendelssohn’s early organ works, but the debt is clear in the whole oeuvre including the Three Preludes and Fugues Op. 37 and Six Sonatas for Organ Op 65 which are the pinnacles of Mendelssohn’s compositions for the instrument. 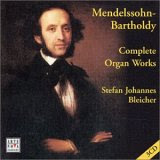 In 1822 Mendelssohn played an organ built by Aloys Mooser in the small town of Bulle in Switzerland, and this was used by Stefan Johannes Bleicher to record Mendelssohn’s complete organ music which is now available on a super-budget priced 3CD set from Arte Nova. The classical design and build of the Aloys Mooser organ guarantee authenticity, and the sound and performances are excellent on this outstanding set. 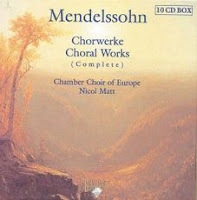 Bach’s model is also clear in Mendelssohn’s choral works, particularly the eight chorale cantatas. These can be enjoyed in an outstanding 10CD box of Mendelssohn’s complete choral works from the enterprising Dutch super-budget label Brilliant Classics. I cannot recommend this set highly enough. These are not previously issued recordings released under licence, they are sparkling new digital recordings which offer excellent sound with Reinhard Geller doubling as producer and engineer. The Chamber Choir of Europe under Nicol Matt give exemplary performances, and the packaging is excellent and includes complete texts. I bought my set for just €24.99 (£14/$27) in Galeria Kaufhof in Leipzig last year, a store that almost overlooks St Thomas’ and is a short distance from the famous Mendelssohn Haus. These two enterprising super-budget labels have got their fingers on the musical pulse, and understand that there is much more to Mendelssohn than the Violin Concerto. Their sets of the complete organ and choral music offer outstanding opportunities to explore Mendelssohn’s lesser known music at highly affordable prices. What more can we ask in this anniversary year?